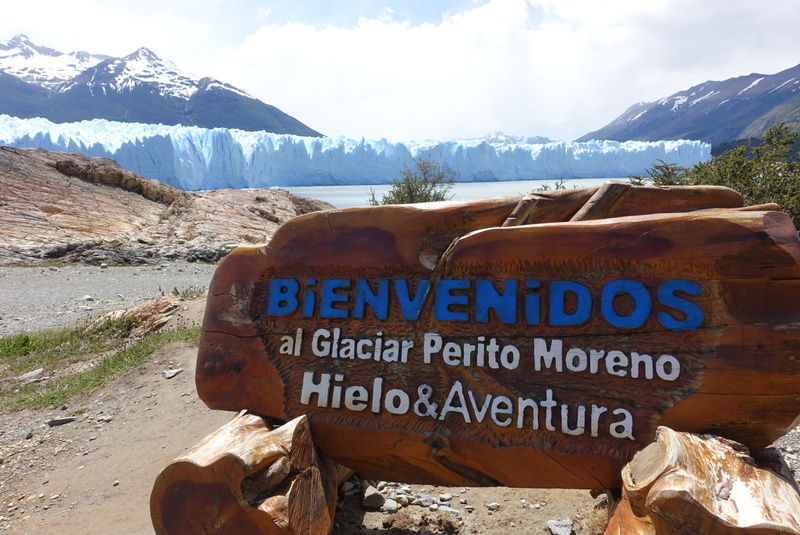 Glaciar Perito Moreno – ¡Vamos! What an impressive glacier! It is one of the few glaciers out there that isn’t receding. In the back of the glacier, it’s always snowing. This snow accumulates, becomes compact, and turns into ice- adding to the glacier everyday. On the viewing end of the glacier, you can hear little pieces and huge chunks falling off the glacier every few minutes. It grows 2m a day and recedes 2m a day- making it a stable glacier. This fact alone makes the glaciar exceptional but really, as a simple tourist, I was simply amazed by its mass. Argentina has done a great job building long platform walkways and lookouts for you to appreciate the glacier from various angles. You can even walk on it! Hielo y Aventura offers two treks on the ice: minitrekking and Big Ice. The first one is a 10 hour tour and the second one is a 12 hour tour from El Calafate, including 4-5 hours of transportation time and 1 hour of lunch. For minitrekking, you walk for 1.5 hours on the ice and for Big Ice I think you walk for ~3.5 hours. The main selling feature for the Big Ice is that you get to see caves (and possibly go inside them depending on the conditions). Marc and I did the minitrekking as recommended to us by people who did the Big Ice and I’m glad we did. We were pretty much done after walking on it after an hour. It’s pretty tiring walking on the glacier when the weather keeps changing between various mixtures of sunny, windy, raining, and snowing. We have become very familiar with Patagonia’s ridiculously moody weather behavior and it isn’t any better on ice! It is pretty incredible knowing you’re walking over ice that’s been forming for over 400 years.